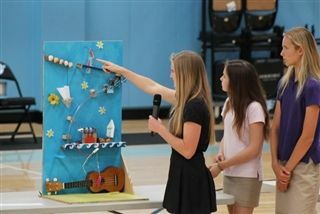 In March, teams of 8th-grade students spent several weeks creating Rube Goldberg machines to present to their Conceptual Physics classes. The complex machines, named after the famous cartoonist, take several convoluted steps to perform a simple task. Before putting their machine into action, students explained the physics of each energy transfer needed for the apparatus to achieve its desired result. On Wednesday, April 15th, six teams of finalists presented their inventions to the Middle School and a panel of judges from the community. Congratulations to winners Amelia Whitworth and Sarah Freeman, and to all the 8th-grade inventors for their hard work and ingenuity!